I've known Father Mark Browne for as long as I've been alive. His son, John-Mark is my oldest and dearest friend. Mark has a heart for the young children and adults of Russia. Since I can remember, he has been taking groups of people from around the U.S. and the world over to Russia during the summer to run camps for kids- some of the poorest in the country. Since he began his work over 16 years ago, Mark has led well over 35 trips to Russia. His long term commitment to the children and their community is a model we all can and should learn from. His organization, Relationship Bridges International, serves as the organization behind these trips. This coming summer, the camp will host over 100 orphans and 700 impoverished kids. If they win, the money will go to invest in the future and well being over 800 kids. Pretty awesome, huh? They are passionate about the Lord and sharing that hope with these kids through relationships. 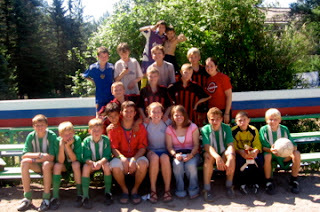 Mark and his team work collaboratively with churches around the United States and with a team in Russia to ensure the long term investment in these kids- beyond just summer camp. The team is involved in all kinds of programs from education to feeding to providing clothing and resources for these kids. Mark is also the pastor at Christ's Church in Virgina. So, what do you think? Remember- every comment = one vote! Go team. I think I've been on Mark's email list for some time, but I could never remember exactly how. Makes more sense now :). Best wishes To Mark for doing such abeautiful awesome job. Mark is one of the most encouraging, loving, and supportive people I know. His heart for others to know Christ is amazing! I thank God for putting Mark in my life. He walks the walk that only a heart for Christ can sustain, nourish, and share! Go RBI! I'm voting for Relational Bridges International!!! !